When Kathy Barnard says this, she means it. 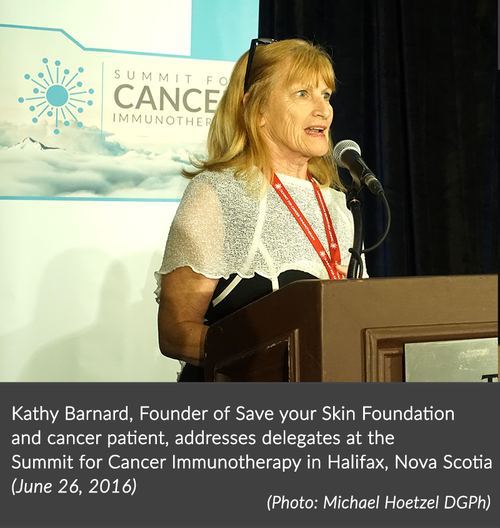 Kathy Barnard founded and runs Save Your Skin, a patient advocacy and support organization that has been on the front lines as immune-oncology has emerged. Save Your Skin helps inform legislation (Federal Bill C-386 Tanning Bed Legislation for Youth), patient-care policies and guidelines, and provides individual financial, informational and emotional support to cancer patients. When she was diagnosed in 2003 the options for melanoma were scant: wait and see (so, nothing), or try interferon, which probably won’t work and has brutal side effects. Barnard is a highly competitive baseball player and brought this determination to her mortal battle with cancer. She researched emerging immunotherapies. She sought out clinical trials and the doctors leading them in Canada. She travelled across provincial borders to participate in these experiments. “I am the recipient of three experimental immune-oncologies, starting in 2003,” said Barnard. “I used to call us melanoma patients the Pluto of the solar system, because if you were diagnosed with melanoma there was nothing for you back then in 2003 until 2006 and 2007. We really were pioneers of immune-oncology. At the inaugural Summit for Cancer Immunotherapy held at the end of June, Barnard outlined how those side effects are improving by sharing her own journey in an address she gave to researchers and industry partners. First diagnosed with malignant melanoma in 2003, Barnard was facing a dire prognosis by 2005, when her cancer had spread to her left lung, kidney, liver and adrenal gland. After treatment with interferon, she had no remaining treatment options available to her in B.C. Barnard found a clinical trial in Alberta for Proleukin, traversing the Rockies for every treatment. Although the side effects were almost as bad as interferon, it helped to diminish her tumours. But in 2007, they found a 9 cm tumour in her bowel, which she had surgically removed before being enrolled in another clinical trial, again in Alberta. This time it was for Yervoy, with side effects that were much more tolerable than the previous treatments. At the end of it, she was clear of cancer except for a small tumour in her right kidney, which was removed in January 2009. She has been cancer-free since. As she concluded her talk, Barnard thanked all the researchers, because, as she says, she wouldn’t be here had it not been for the work of researchers making the progress they do. “The researchers, that’s where it all starts,” said Barnard. “But I sometimes wonder if they know where it ends up. I want them to work hard every day because these agents that they are working are amazing. They save people like me. They make a difference in my life and my family’s life so I can turn around and hopefully make a difference in somebody else’s life. Barnard sees groups like hers playing an important role in ensuring that effective, new therapies are not only approved in Canada, but are also available equitably to those who need it. She, like others, don’t want access to treatment to be determined by your postal code. And there are other questions, about companion diagnostics, about access to sequential immunotherapy treatments, about the process of drug approvals in Canada.